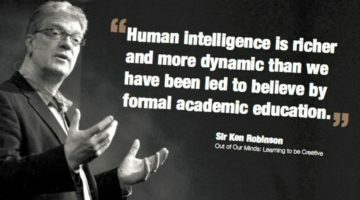 Sir Ken works with governments and educations systems in Europe, Asia and the USA, with international agencies, Fortune 500 companies and some of the world’s leading cultural organizations. In 1998, he led a national commission on creativity, education and the economy for the UK Government. All Our Futures: Creativity, Culture and Education(The Robinson Report) was published to wide acclaim in 1999. He was the central figure in developing a strategy for creative and economic development as part of the Peace Process in Northern Ireland, working with the ministers for training, education enterprise and culture. The resulting blueprint for change, Unlocking Creativity, was adopted by politicians of all parties and by business, education and cultural leaders across the Province. He was one of four international advisors to the Singapore Government for its strategy to become the creative hub of South East Asia. For twelve years, he was professor of education at the University of Warwick in the UK and is now professor emeritus. He has received honorary degrees from the Rhode Island School of Design, the Open University and the Central School of Speech and Drama; Birmingham City University, the Liverpool Institute for Performing Arts and Oklahoma State University. He was been honored with the Athena Award of the Rhode Island School of Design for services to the arts and education; the Peabody Medal for contributions to the arts and culture in the United States, the Arthur C. Clarke Imagination Award, the Gordon Parks Award for achievements in education and the Benjamin Franklin Medal of the Royal Society of Arts for outstanding contributions to cultural relations between the United Kingdom and the United States. In 2005, he was named as one of Time/Fortune/CNN’s‘Principal Voices’. In 2003, he received a knighthood from Queen Elizabeth II for his services to the arts. His 2009 book The Element: How Finding Your Passion Changes Everything is a New York Times best seller and has been translated into twenty-one languages. A 10th anniversary edition of his classic work on creativity and innovation,Out of Our Minds: Learning to be Creative was published in 2011. 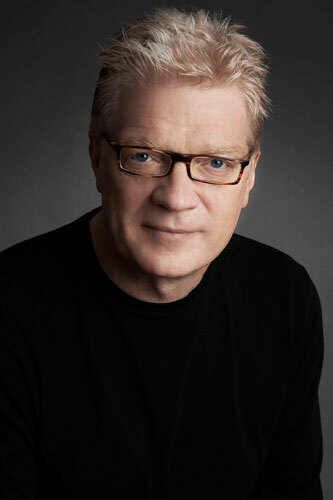 His latest book, Finding Your Element: How to Discover Your Talents and Passions and Transform Your Life, will be published by Viking in May 2013. Sir Ken was born in Liverpool, UK. He is married to Therese (Lady) Robinson. They have two children, James and Kate, and now live in Los Angeles, California.